I’ve been using an iPad mini 4 since it was released in September 2015. It is a great device in an easy to pack up and carry form factor. The full-sized iPad and iPad Pro are great but, for me, too big to carry on an “everyday” basis (toting a large enough carrying case for a full-sized iPad). 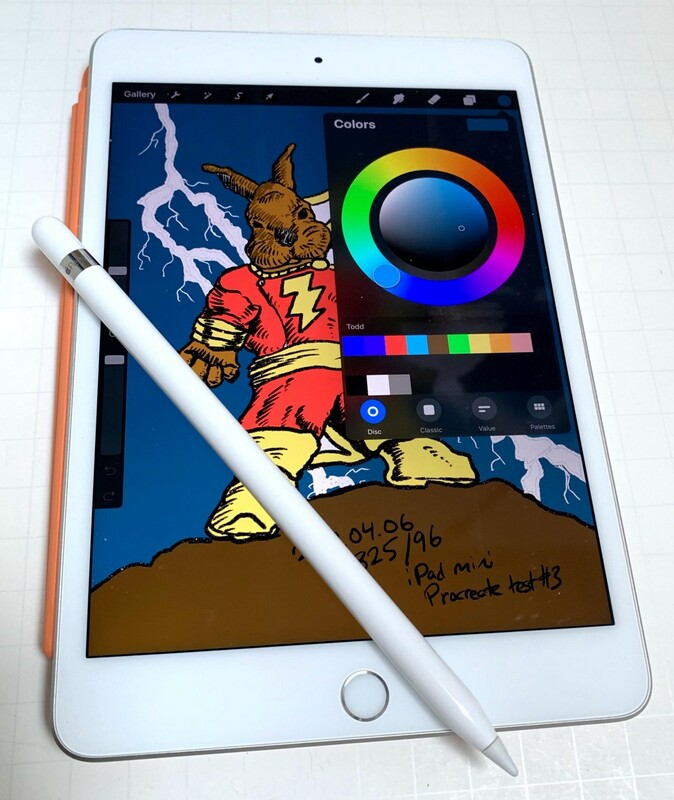 For me, the only thing the iPad mini lacked was support for the Apple Pencil for my Doodle-a-Day project. So, when Apple announced the 2019 iPad mini (the first update to the mini since September 2015) supported the first generation Apple Pencil, I ordered it immediately. I have been using a iPad Pro 9.7 or 10.5 with the Apple Pencil for my Doodle-a-Day project since January 1, 2017. I’ve used both Procreate (mostly) and Tayasui Sketches Pro for doodling. Procreate was tapped for the first doodles on the 2019 iPad mini. The iPad mini has a lightning port like older iPads instead of USB-C like newer iPad Pro models. The mini is so thin that you need to either lift the mini a bit to charge a Pencil or turn it over screen down if you have a cover (as I do). Although the mini’s display is laminated like the iPad Pro displays, it sometimes feels like there is a bit of an air gap between the touchscreen glass and LCD. It also feels like there is more drag on the mini’s display compared to using the same Pencil on an iPad Pro’s display. That said, the experience of doodling is quite good on the mini. And, Procreate looks and works as I expected. I haven’t seen any odd little problems because of the smaller screen size. I’m very happy having a smaller form factor iPad to use for my Doodle-a-Day project as well as the usual tasks that the mini performs for me every day of the week. Some reviewers have taken umbrage to the new mini’s lack of design change which includes having relative large bezels and a physical home button. Personally, I like having a bezel. It means I don’t have finger prints on the screen from picking up the mini. And, as for a physical home button. Well, I’ve used one since the iPhone 3G and don’t have any issues with it. Next up? Using Tayasui Sketches Pro on the 2019 iPad mini for my doodle project.